We prefer round static compost bins over square ones, as it can be tricky to get right into the corners to turn over the compost in square models. If you grow flowers, vegetables, or other plants in your yard, you probably go through a hefty amount of expensive compost. Using a garden composter not only gives you free, nutrient-rich compost, it also lets you recycle your own garden waste. What's more, you control exactly what goes in your garden composter, so there are no unwanted materials or nasty surprises. 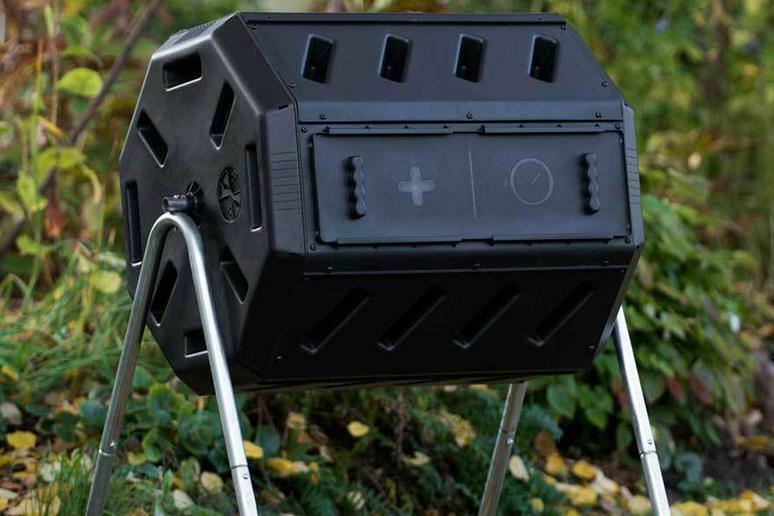 You'll need to consider a range of factors when picking out a garden composter. Do you want a compost bin or a tumbler? What about dual chambers? Does color matter? Read on to find all the relevant information to choose the right garden composter. Compost bins are static garden composters that sit on the ground. They usually have open bottoms so that excess liquid can sink into the earth. They generally have large capacities and a low cost, but you need to turn the compost manually with a garden fork, which can be time-consuming. Compost tumblers sit on a frame so that you can spin them to easily turn your compost. While they're simple to use, they cost more and have smaller capacities than many compost bins. Full-size garden composters range in capacity from as little as 30 gallons to as much as 200 gallons (or occasionally even more). Compost tumblers rarely exceed 80 gallons in capacity, whereas compost bins almost never have capacities of less than 60 gallons. While it's important to think about capacity, an average gardener with a mid-sized yard won't need a garden composter with a huge capacity - 50 to 80 gallons should suffice. Although you can find wood composters, plastic models are usually more effective as they trap and retain heat better (and heat is an important part of the composting process). Plus, they tend to be durable and weatherproof. That said, you can find some flimsy plastic options, which you should avoid. Some garden composters have dual chambers. As the name suggests, this means there are two separate composting chambers. Compost can take as long as 12 months to be ready to use, so the dual chamber design lets you start a new batch while your old batch is still brewing, this way you won't have a large gap between batches. Some tumbler-style garden composters are constructed with wheels, so you can move them around your garden to a convenient spot to put your trimming or clippings inside, or to distribute fresh compost. Some people find it easier to move the composter around, but others prefer to just bring their composting materials to the tumbler. The color of the composter might seem like an unimportant factor, however darker colors can be crucial to the process of breaking down materials. Since adequate heat is important for compost to break down, garden composters with darker exteriors are often more effective than those that are lighter on the outside. That's why you'll find the majority of composters are black, dark green, or other dark colors. Basic garden composters start at around $50 to $60 for smaller bin-style composters. Larger compost bins and small or basic tumblers cost around $80 to $150. The most expensive garden composters (usually large, sturdy tumblers) can cost over $400. Q. Is there anything I shouldn't put in my garden composter? A. Composters are designed to break down plant matter, so anything else is discouraged. Avoid putting food waste in your composter, except for raw fruit and vegetable scraps. Q. Where should I position my composter? A. Place it somewhere in the garden that's convenient to access. You'll be less likely to use a garden composter that's tucked away at the far end of your yard. Our take: This sturdy galvanized steel composter is a true workhorse that could last a lifetime. What we like: Dual chamber design. Excellent heat retention. Decent 70-gallon capacity. What we dislike: The price tag is too high for some. Our take: Although it's on the smaller side, this is an affordable option that easily suits people with small yards. What we like: Stands out for its sturdy construction and dual chambers, while offering excellent value for money. What we dislike: Some buyers find it difficult to assemble. Our take: It might seem costly for its size, but this is a carefully designed and effective garden composter that's worth the price if you can afford it. What we like: Produces both solid and liquid compost, made from food-safe and BPA-free material. What we dislike: Can be tricky to turn.